The colossus of Ramses II arrived safely at its new display area in the atrium of the Grand Egyptian Museum on Thursday, in preparation for the museum’s soft opening later this year. The statue had been being stored in another part of the GEM, and the 400-metre journey to its permanent resting place was marked with ceremony. Senior officials were in attendance, and the statue was preceded on its jourey by 11 Egyptian horsemen in ceremonial military dress. As it reached its final location, the national anthem was played. Thursday’s trip was the fourth time that the colossus of the great king, who ruled from 1279–1213 BC, has been moved. The first trip took place 3,000 years ago; the statue was carved in an Aswan quarry and then taken to Mit Rahina archaeological site in the Memphis necropolis, to be displayed as part of the façade of Ptah’s temple. In 1955, president Gamal Abdel-Nasser decided to move the statue to Bab Al-Hadid (now Ramses Square) in Cairo, as part of an initiative launched by the minister of governmental affairs, Abdel-Latif El-Boghdadi, to beautify the streets and squares of Cairo. The third relocation was in 2006 when former minister of culture, Farouk Hosni, decided to move the statue from Ramses Square to the headquarters of the GEM to protect it from pollution. The relocation process was carried out in collaboration with the Engineering Authority of the Armed Forces and the Arab Contractors Company, which was responsible for the previous move in 2006. Antiquities Minister Khaled El-Enany said that over the past three months the statue has been intensively studied to assess its condition before transportation. Safeguarding procedures have been put in place, and the foam rubber covering the statue has been replaced with stronger material and weak points consolidated. El-Enany added that the whole process has cost about EGP 13.6 million, including packing and unpacking the statue and preparing the road. 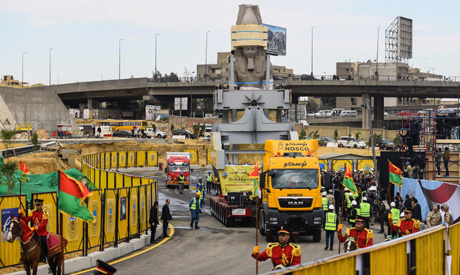 Mohsen Salah, chairman of the Arab Contractors Company, told Ahram Online before the move that the statue would be transported in at iron cage, wherein it would be hung like a pendulum to allow it to move freely during the 400-metre journey. Tarek Tawfik, supervisor general of the Grand Egyptian Museum, said that the museum is expected to be fully open totally in 2022, but its soft opening will be at the end of this year. The museum, located on the Giza Plateau, will feature an atrium, a grand staircase, and the Tutankhamun hall. The golden king’s whole collection will by put on show for the first time; it includes 5,200 artifacts. The partially broken colossus of Ramses II was discovered at Mit Rahina archaeological site in 1820 by the Italian adventurer Giovanni Caviglia, along with another similar one that remains on site. Caviglia tried to move it to Italy but he was unable to because of its 83-tonne weight. Mohamed Ali decided to offer the statue to the British Museum in London but the offer failed for the same reason. The statue stood in its place at Mit Rahina until it was eventually transferred to Ramses Square.